Soulpepper’s second revival of Ferenc Molnár’s 1926 comedy The Play’s the Thing is a bit tired around the edges. Director László Marton directed the play’s previous iterations and directed a new production for the Vígszínház in Budapest in 2009. He doesn’t seem to have mustered much enthusiasm for returning to this revival of his old production and has allowed a few details to slip. The production is not as crisp and vital as it was when last seen in 2003, which still remains the best of the three stagings. For those new to the play, the plot involves the successful dramatist Sandor Turai (Diego Matamoros) and his collaborator Mansky (William Webster) who have written the libretto of a new operetta set to music by their protégé and Turai’s nephew Albert Adam (Gordon Hecht). Adam is engaged to the prima donna Ilona Szabo (Raquel Duffy). All seems well until the three operetta writers overhear Ilona’s former lover Almady (C. David Johnson) in passionate conversation with Ilona in her bedroom and assume the worst. The distress causes Adam to want to tear up his score and break with Ilona, but Turai has a plan to save the situation. He will try to convince Adam that what he overheard was merely Ilona and Almady rehearsing a play. Turai thus makes what was real into a fiction in order to cause a real beneficial effect. Luigi’s Pirandello’s Six Characters in Search of an Author (1921), the ultimate play about reality and illusion in drama, was written just five years before The Play’s the Thing (Játék a kastélyban in Hungarian, literally “The Play in the Castle”). Yet, where Pirandello sees melodrama, anxiety and despair in the collision of reality and illusion, the Hungarian Molnár is wryly amused by the irony of life. He sees there is artifice in reality and truth in fiction. Molnár’s play not only includes a play-with-a-play, the one Turai writes using the actual dialogue of Ilona and Almady, but Molnár presents us with characters on stage who speculate about how a play with them as characters should be written. Act 1 begins with Turai wondering how the first act of a play should begin and if there is any way around the use of tedious conversations to introduce the characters to the audience. Why not just bypass all that talk and have the characters introduce themselves? And that’s exactly what the Turai, Mansky and Adam do. They are speaking to a fictitious audience who happens to be exactly the same as the real audience. Act 2 is even more daring when Molnár has the same three discuss the problem of how to end the second act of a three-act play. Then each of them enacts his own ending. Thus, Molnár presents us with actors playing characters who think they are real but imagine themselves as characters. Hamlet may say that “the purpose of playing … is, to hold as 'twere the mirror up to nature”, but Molnár suggests that Hamlet’s view misses the artifice inherent in playing and that our perception of nature is itself molded by artifice. It is for this aspect of the play that Marton shows the most interest. When the play begins the chandeliers are found lowered to table height and the back curtain has not been raised allowing us to see the real brick back wall behind the stage in the Baillie Theatre. Only after Turai and his his friends have discusses how plays should begin do the chandeliers rise and the back curtain rise into place. Marton does, however, miss the chance to have Matamoros as Turai make some gesture to suggest that he is stage managing the reality on stage, as Turai will later in the play. Marton has the three endings to Act 2 played so convincingly that the audience applauds after each one, happily duped by the first two false endings. Another effect of Marton’s attention to this theme is that the presence of the character Dwornitschek (Oliver Dennis) finally makes more sense. In the previous two stagings, the ultra-proper footman seemed merely to provide Turai with something other than his comrades to joke about. 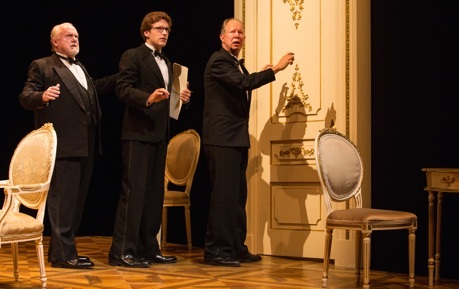 In this production, Turai’s questioning of the servant about his private life is so humorous because Dwornitschek has so embodied the artificial role of ideal footman that there he seems to obliterated any real self beneath the role. 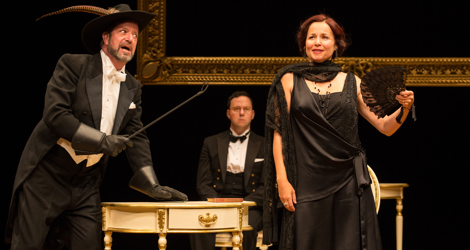 Three actors have now performed the same roles in all three Soulpepper stagings – Matamoros, Webster and Johnson. The role of Ilona, last played by Allegra Fulton is now equally well played by Raquel Duffy. Oliver Dennis is a perfect replacement for Michael Hanrahan as the Dwornitschek, and Gordon Hecht and Gregory Prest are less capable than Jonathan Watton and Jim Warren as Adam and the secretary Mel. Matamoros’s Turai is again the wry, world-weary playwright who views the world with irony and detachment. For some reason, Matamoros gives Turai’s constant insults of his collaborator Mansky a much sharper tone than they should have to the point that we wonder why Turai insists on writing with Mansky. For his part Webster’s Mansky is the more emotional and one might say more human half of the Turai-Mansky team and we can see why Turai needs him even if Turai doesn’t recognize it. For the third time, C. David Johnson’s performance as Almady steals the show and makes the hilarious third act rehearsal scene reason enough to see the play. A major joke on Almady that Turai has written into this play that Almady and Ilona were supposedly rehearsing late at night is Turai’s encumbering Almady with reams of complex French proper names. Having done this role now three times, Johnson sails through these six- and seven-part names with aplomb, thus contradicting the difficulty that Almady says they give him. In 2003, Johnson always hesitated before launching into one of these names, scowling as he said them, as if Almady were having trouble remembering them. This made Almady’s increasing exasperation both funnier and more understandable. Raquel Duffy is the sprightliest of the three actors who have played Ilona and is the most believable as a love interest for Adam. While the character of Adam is a generic young artist in love, Gordon Hecht does nothing to give him a personality. His Adam strangely remains blank-faced even when Ilona in standing right near him. In Act 2 he ought to be furious with her, but Hecht shows nothing. Gregory Prest, who has given so many fine performances in the past, seems all at sea about how to make the always-nervous secretary Mel funny. Oliver Dennis gives us a perfect Dwornitschek, a centre of absolute calm and propriety completely untouched by the storm of emotions and eccentricities swirling about him. If you have never seen the play before and are looking for a light comedy that plays with notions of what theatre is, then you should take this unusual chance to see it. If you have seen Soulpepper’s production before, either in 1999 or 2003, you may notice that the champagne of the comedy is not quite as effervescent as it was before, though it it still quite respectable. With three goes at Molnár’s The Play’s the Thing, along with his Olympia in 2005 and The Guardsman in 2009 plus the now biannual production of Miklós László’s Parfumerie starting in 2009, Soulpepper has introduced audiences to more Hungarian theatre than any company ever has in Toronto. Since no other classical company has explored the drama of eastern Europe to this extent, let’s hope Soulpepper continues to mine this vein that has proved so successful and so enlightening. Photos: (from top) C. David Johnson , Gregory Prest and Raquel Duffy; William Webster, Gordon Hecht and Diego Matamoros. ©2015 Cylla von Tiedemann.